In this competitive world, most of the industries play around with customers order by compromising on the quality. Similar kind of incidents also occurs in solar sectors, due to the competitive market of Solar PV Rooftop industry. To get orders installers aggressively quote the prices to install solar PV rooftop system. But this might not be from the margins instead of low system components. Most of the customers focus on the quality of inverters and panel. Although, the standard of inverters and panels should give a higher generation of power and cannot be denied. Nonetheless, we cannot ignore the quality of earthing and other protection components for a better working and trouble-free life. As a result, for the well-being of solar power generation, these components of the total system means a lot. It can prove to be fatal for human life as well as power system, if any low-quality standards or compromise is used for ABDB, Earthing, AJB, SPD, etc. So is your solar PV rooftop system safe and protected? 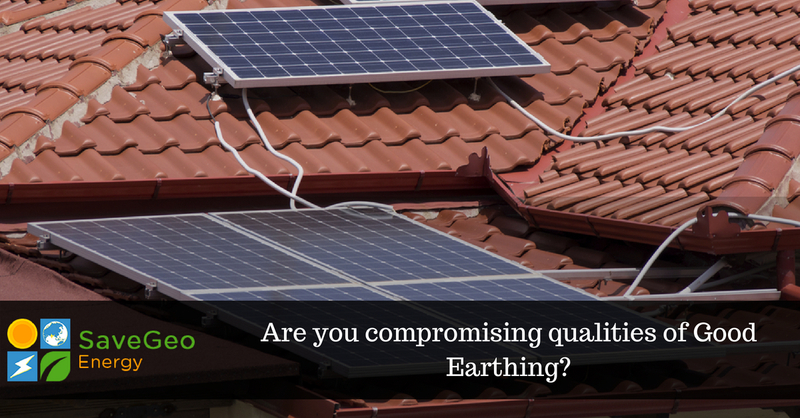 In this piece of content, we will discuss the quality of earthing and other Protection components issues based on Rooftop Solar Panel System. Nowadays, most of the installers are compromising on qualities of good earthing by using plain commercially available GI wire instead of GI Zn plated copper wire or strips. To understand about the Good Earthing, the earthing strips or wire should exhibit low electrical resistance, able to withstand the impact of corrosion inducing agents and most of all be able to dissipate high fault current repeatedly. For best solar PV rooftop system, the installer needs to construct using superior quality of strips or wires for earthing like aluminum, copper or Galvanized Iron (GI). Apart from this, there has to be flexibility in width and thickness, as regular earthing strips can have its depth anywhere between 3 to 6 mm. on the other hand the width of normal earthing may vary from 15 to 100 mm. As a result, in varied applications, this flexibility ensures that the strip can prove useful. In a perfect earthing strip, you may seek all the qualities loaded in a galvanized strips. However, many lives have claimed with disregard of safety matters and use of faulty electrical equipment. Therefore, it is a must to have a robust build, corrosion resistance and accurate dimension in the chosen earthing strip for your application. By the ISI specifications, the strips are subject to galvanization and are manufactured using premium quality copper, iron or steel. These strips are most preferred in rocky areas, as galvanized strips coated with zinc is recommended to be a minimum of 80 microns. Nevertheless, the hot dipped galvanized iron strips have a thickness of 3 to 12 mm and width in the range of 25 to 75 mm. The strips during their lifetime require less maintenance, as they have protracted life. Lightning and surge protection devices – another issue that arises with poor selection resulting due to continual and intermittent difficult-to-diagnose problems in a facility, often failing equipment and loss of production. In Array Junction Box (AJB) and AC Distribution Box (ACDB), most of the solar power installer does not add the required protection devices to save money. However, as per the design fuses, surge protection device (SPD) and DC Isolator if not present in the Inverter should be added, to have a safer functioning of the Solar PV rooftop system on the DC side AJB. Wondering why all these things are important? It is essential as they avoid worst scenarios that often happen on the site. For instance, if DC side surge protection device and fuses are not added, and a high surge comes, then it may damage the Inverter, and we all are aware that Inverter Company’s warranty does not cover claim on damage due to such scenarios. As a result become aware and get a complete check of the material with your installer, whether they are using the appropriate protections such as AJB, ACDB, Earthing, and LA. If yes then of what standards and quality, so that the Rooftop Solar Panel System installed is adequately protected and works securely. SaveGeo harnesses the power of solar energy by providing efficient, state-of-the-art rooftop solar solutions to help organizations and homeowners reduce their carbon footprint in a cost-effective and eco-friendly manner.